The increasingly polluted Volga River is creating ahealth crisis for the 60 million Russian citizens who live in its enormous and economically important basin, but the Russian government has not been independently monitoring this situation since Vladimir Putin disbanded the State Ecology Committee in 2000. In the current issue of “Argumenty nedeli,” journalist Denis Terentyev surveys the damage, noting that few officials appear to care although people living along Russia’s great river can see the increasingly negative impact of pollution on the river, its wildlife, and on themselves. One of the reasons that the Volga has become so polluted is that since the 1930s it has been less a river than a string of reservoirs created by dams, an arrangement that means the speed of its flow is ten to fifteen times less than it was a century ago, reducing the ability of the river to cleanse itself. But the most important reasons lie elsewhere with oil spills and the continued dumping of industrial waste into the river, leaving it with contamination eight times greater than the average for Russian rivers and 350 times the rate for the Lena River to give but one example, according to research by University of California scholars. In recent years, such wastes have become a less significant contaminant of the Volga than fertilizers which flow into the river either because of irrigation or rain. This new threat means that concentrations of the chemicals contained in such fertilizers are now 50 times above health norms, according to Saratov’s Green Patrol ecology movement. And adding to the problems that industry and agriculture as causing is the longstanding practice of allowing ships, barges, and even oil tankers that have ended their useful life to sink in the waters of the river, with all the obvious contaminants they contain. 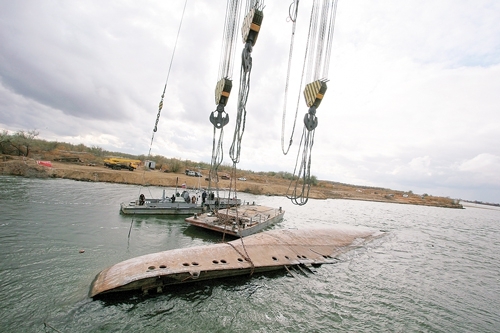 There are now about 2500 such abandoned vessels in the river, with 800 of them being in the Astrakhan area alone. Obviously, all these contaminants have an impact on the ecology of the river and its basin. First to react to the poisoning of the river have been the various species of fish there. A generation ago only six to seven percent of the fish there had mutations; now among some kinds, they have risen to 90 to 100 percent. Indeed, some residents even collect these mutants. First and foremost, experts say, it is absolutely essential that no one and especially children drink untreated Volga water, but unfortunately some of the cities along its course still do. One of them is Ulyanovsk. The consequences: According to a survey in 2009, cancer rates there were 20 percent above all-Russian averages. In 2011, then-President Dmitry Medvedev called for a national problem “to save the Volga.” But he said Moscow would invest only 300 million rubles (less than nine million US dollars), an amount that experts say is far too small given the task: As Terentyev notes “it is 2000 times smaller” than the Russian government says it has spent for the Sochi Olympics. Boris Aleksandrov, a human rights activist, says that this is a clear “demonstration of priorities. For the authorities the Volga is not valuable in and of itself but only as a suitable artery for the export of resources and as a source of fish and electrical energy. Tey are much less interested in the people who live in the Volga basin and drink water from the river. Hello ! They are first of all citizens. And citizens of the so-called Russian Federation. Some of them are russian, others mari, chuvash, and so on, living along the Volga river. A rignt designation is the point. And a scandal for many. 60 million people live in fear of their polluted water. Thank you for bringing this to my (our) attention.